KINGSPORT — New Tennessee Gov. 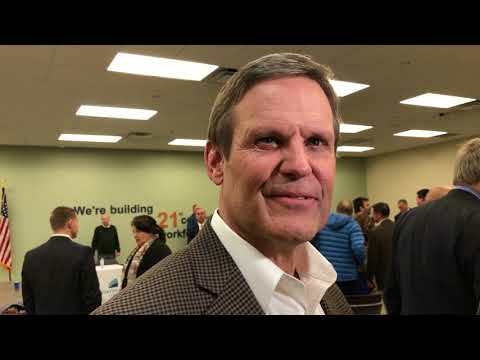 Bill Lee plans to make middle school students more aware of career technical education careers and to potentially model across the state the apprenticeship programs at the Regional Center for Advanced Manufacturing in downtown Kingsport. 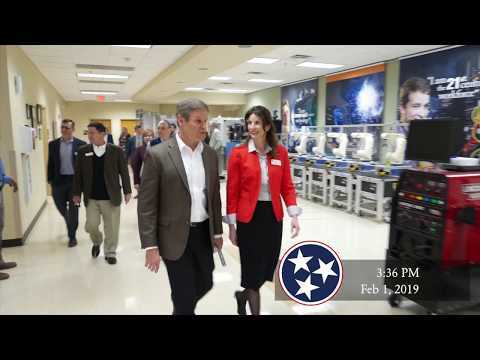 Lee toured the RCAM Friday afternoon and then participated in a roundtable discussion with representatives of local industries, Northeast State Community College, Kingsport City Schools and Sullivan County Schools. He attended a similar event in Chattanooga earlier in the day and went to the Kingsport Chamber of Commerce Annual Dinner that night. On either side of Lee at the head table were Jeff McCord, the “Dr. Commissioner” of the state Department of Labor and Workforce Development and NSCC President Bethany Flora. McCord was vice president for Economic and Workforce Development at NSCC. He led Workforce Solutions, a program that includes the development of registered apprenticeship initiatives, and the RCAM, a technical career education academy in the Academic Village, for NSCC until Lee tapped him for the Cabinet position. “You all know him?” Lee quipped as he entered the room at the RCAM, where elected local and state officials and secondary and higher education folks and the media awaited him. Flora talked about more than 300 registered Department of Labor apprenticeships provided through the RCAM. “I’m like a bad penny, just keep on showing up,” McCord later said. Republican Lee, who beat Democrat Karl Dean in the November 2018 general election, told the group that government often doesn’t provide an answer to problems and sometimes gets in the way of solving them. However, he said government can facilitate partnerships between public and private groups such as the training and education programs at the RCAM. “When we form partnerships, there is strength there,” Lee said. “Government is not going to answer our problems” but can facilitate partnerships that can. In the next few weeks, Lee plans to introduce legislation to make the state’s seventh- and eighth-graders more aware of vocational programs and not just push a four-year college path as the best one. After the event, he told reporters he wants to see high school guidance counselors make even middle school students aware of potential vocational careers. During the roundtable, he said he’s frozen state regulations for 90 days to help farmers and others. “Government oftentimes gets in the way of businesses and farmers and folks trying to live their lives,” Lee said, emphasizing his campaign goal of working for good education, good jobs and safe neighborhoods. Health McMillian, RCAM director, said the RCAM works to meet workforce needs, do education outreach for the pipeline of skilled labor and participate in economic development, all through partnerships. “There’s an old saying: If you want to go fast, go alone. If you want to go far, go together,” McMillian said.